Golden eagle. Photo by Jim Watson. The golden eagle is a large, dark raptor with a golden crown and nape, and wingspan of up to 7 feet (Figure 1). The species breeds at higher densities in mountainous and open areas dominated by shrub-steppe communities, but also nests at lower densities in conifer forest where open space occurs (e.g., burns, clearcuts). Most nests in mountainous areas occur on large cliffs, but tree nests are used in flat terrain at lower elevations in more open and semi-open landscapes and in areas dominated by conifer forest (Kochert et al. 2002, Watson 2010). Golden eagles forage in grasslands and shrublands and prey primarily on mammals, such as jackrabbits, cottontails, ground squirrels, and marmots, and secondarily on birds, such as ring-necked pheasants and chukars (Knight and Erickson 1978, Kochert et al. 2002). Washington breeding birds are non-migratory. Annual surveys conducted in the western U.S. (excluding California and Alaska) from 2006-2010 indicated no significant trends in abundance, with an estimated 23,833 golden eagles present in 2010 (Nielson et al. 2011). Because populations may fluctuate cyclically with prey populations (e.g., Kochert and Steenhof 2002), surveys of less than ten years are not likely to the long-term trend in abundance. Humans are the leading cause of golden eagle mortality, either directly or indirectly (Kochert et al. 2002). A compilation of the causes of 4,300 bald and golden eagle deaths during the early 1960s to mid-1990s found that humans caused >70% of recorded deaths, with accidental trauma (e.g., collisions with vehicles, power lines, and other structures) being the primary factor (27%), followed by electrocution (25%), illegal shooting (15%), and poisoning (6%) (Franson et al. 1995). These major threats continue to affect golden eagles today. 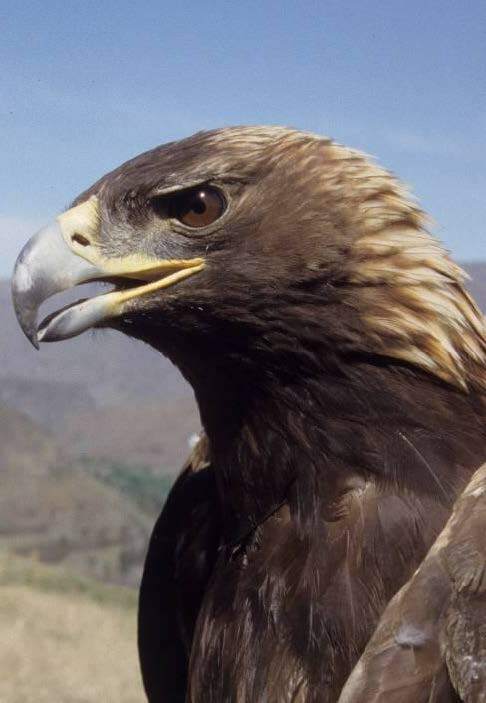 Lead poisoning is a concern for golden eagles in most parts of their western range. In Washington, elevated lead levels in blood were detected in more than half of 14 birds, with four of the birds having lead levels indicative of toxicosis (Watson and Davies 2009). Individuals likely ingest lead by feeding on injured or dead waterfowl, small mammals, or deer shot by hunters. Golden eagles, particularly immature birds, are the most commonly electrocuted raptor in the U.S. (Harness and Wilson 2001, Lehman et al. 2007, 2010). Many power pole designs place conductors and ground wires close enough together that a large bird like a golden eagle can touch them simultaneously with its wings or other body parts causing electrocution (Lehman et al. 2007). The majority of electrocutions are associated with low-voltage power lines or those with transformers, rather than high-voltage power lines (Lehman 2001, Lehman et al. 2007). Expanding wind energy development represents another concern for golden eagles. High numbers of golden eagles have been killed at a wind farm in California, but comparable levels of mortality have not been documented at other sites in the U.S. (Watson 2010). The expansion of wind farms in Washington will require long-term monitoring to assess potential effects of mortality on this long-lived raptor. Seven golden eagles have been killed and five injured and had to be euthanized at wind farms in Washington through 2012 (T. Nelson, pers. comm.). WDFW and some wind power companies are collaborating on research of radio-tagged golden eagles to assess movements of nesting birds in and around wind turbines (Watson et al. in review). Declining prey bases are another threat to golden eagles and are commonly caused by habitat loss, alteration, and fragmentation, as well as past and ongoing control efforts. In Washington, a number of prey species of golden eagles have declined, including jackrabbits, Washington and Townsend’s ground squirrels, and yellow-bellied marmots. Inadequate prey availability can affect territory occupancy and nesting success of golden eagles (Kochert et al. 2002). Surveys and monitoring. 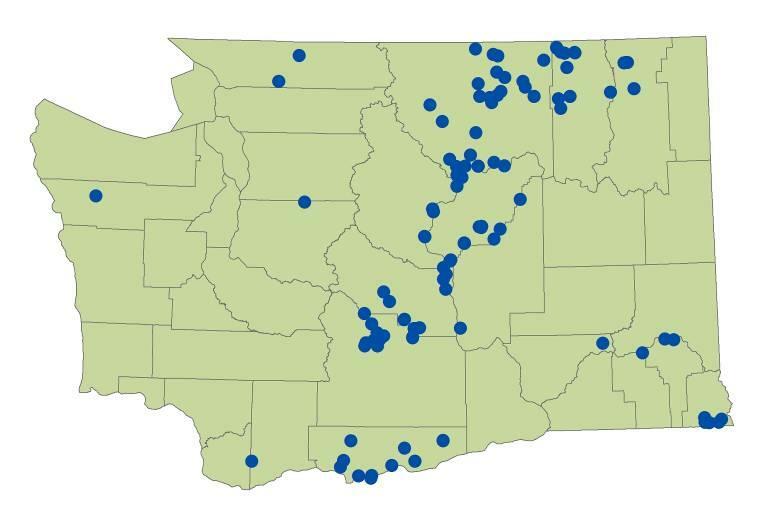 WDFW and partners have monitored nesting territories in Washington at varying levels of effort since 1990, with more intensive surveys conducted in 1990, 1999, 2000, 2004, and 2005 (Figure 2; WDFW database). About 60 breeding pairs of golden eagles are currently estimated in the state, with about 270 historical breeding territories known (J. Watson, unpubl. data). In 2012, several new territories were identified from data collected on golden eagle territories and observations from other agencies in preparation for surveys planned for 2013 (Figure 3). Conservation actions and research. WDFW is completing research on habitat characteristics and prey sources and levels of contamination in golden eagles. Resource characteristics of home ranges used by satellite-telemetered eagles will be described for informing proposals to develop windpower. Ongoing and future research being conducted cooperatively with the Woodland Park Zoo, includes nesting eagle and wind turbine interactions and juvenile movements and survival. The U.S. Fish and Wildlife Service is completing a conservation plan for bald and golden eagles. Eagles are protected under state and federal law, and landowners must still comply with the federal Bald and Golden Eagle Protection Act to avoid impacting eagles. Partners and cooperators: U.S. Fish and Wildlife Service, Bureau of Land Management, Woodland Park Zoo, U.S. Forest Service, U.S. Army-Yakima Training Center, Washington Department of Natural Resources. Franson, J. C., L. Sileo, and N. J. Thomas. 1995. Causes of eagle deaths. Page 68 in E. T. LaRoe, G. S. Farris, C. E. Puckett, P.D. Doran, and M. J. Mac, eds. Our living resources. U.S. Department of Interior, National Biological Service, Washington, D.C.
Harness, R. E. and K. R. Wilson. 2001. Electric-utility structures associated with raptor electrocutions in rural areas. Wildlife Society Bulletin 29:612-623. Knight, R. L. and A. W. Erickson. 1978. Marmots as a food source of golden eagles along the Columbia River. Murrelet 59:28-30. Kochert, M. N. and K. Steenhoff. 2002. Golden eagles in the U.S. and Canada: status, trends and conservation challenges. Journal of Raptor Research 36 (Supplement 1):32-40. Kochert, M. N., K. Steenhof, C. L. McIntyre, and E. H. Craig. 2002. Golden eagle (Aquila chrysaetos). The Birds of North America No. 684. Academy of Natural Sciences, Philadelphia, Pennsylvania, and American Ornithologists' Union, Washington, D. C.
Lehman, R. N. 2001. Raptor electrocution on power lines: current issues and outlook. Wildlife Society Bulletin 29:804-813. Lehman, R. N., P. L. Kennedy, and J. A. Savidge. 2007. The state of the art in raptor electrocution research: a global review. Biological Conservation 136:159-174. Lehman, R. N., J. A. Savidge, P. L. Kennedy, and R. E. Harness. 2010. Raptor electrocution rates for a utility in the Intermountain Western United States. Journal of Wildlife Management 74:459-470. Nielson, R. M., T. Rintz, L. L. McDonald, and T. L. McDonald. 2011. Results of the 2010 survey of golden eagles (Aquila chrysaetos) in the western United States. Western EcoSystems Technology, Inc. Cheyenne, WY. Watson, J. 2010. The golden eagle. Yale University Press, New Haven, Connecticut. Watson, J. W. and R. W. Davies. 2009. Range use and contaminants of golden eagles in Washington. Washington Department of Fish and Wildlife, Olympia, Washington. Watson, J. W., A. A. Duff, and R. W. Davies. In review. Home range and resource use by GPS-monitored adult golden eagles in Washington and implications for windpower development. Journal of Wildlife Mangement.